An Affidavit of Domicile is a document that acts as a written solemn oath that verifies where someone lived when they died. The executor of the estate creates this document and uses it during the probate process. The document helps the estate executive transfer ownership of or cash out stock and bond accounts. 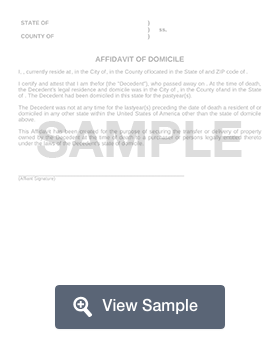 In addition to the Affidavit of Domicile, a certified death certificate may also be required. An Affidavit of Domicile is a legal document that states where a deceased individual lived at the time of his or her death. This document prepared by an estate’s executor. This document is often used to transfer stocks and bonds from one party to another. This document will typically be used when the original owner of the stocks or bonds passes away. The executor of the decedent's estate will then use this document to transfer the stocks and bonds to the next of kin or other appropriate party. Various information will be needed in order for this form to be complete. The executor must have the information about the decedent or original owner, the new party, and the state and county in which the transaction is taking place. The executor of the estate must also make a sworn statement regarding the stocks or bonds and the decedent's wishes for these items. Before this form can be submitted and approved, it must be signed and notarized by all involved parties. This document is also known as a Notarized Affidavit of Domicile. This is sometimes mistakenly called an Affidavit of Residence, which is a different type of legal document. 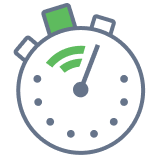 Create a free Affidavit of Domicile in minutes with our professional document builder. When should you use an affidavit of domicile? You should use this document if you are the executor or administrator of an estate that needs to transfer stocks or bonds that were owned by the deceased. You may also need to present this document in probate court. An executor/administrator of an estate must produce an Affidavit of Domicile when they are cashing in the stocks or investment assets that belonged to the deceased. This form is also required by investment firms and brokers to transfer securities ownership. Financial institutions may also require you to provide other information such as a copy of a death certificate and account numbers. The affidavit confirms the deceased person's residence at the time of their death. This is important because it determines which state may levy inheritance taxes against the deceased person’s assets. To create an Affidavit of Domicile, you will need information about the decedent and the new party that is taking ownership of the assets. You may want to look at a sample affidavit online before you start. The executor of the estate should sign the completed domicile form in the presence of a notary public, who will also sign and date the form and provide their stamp. You will need to provide photo identification to the notary. An affidavit of domicile is considered sworn testimony - this means that you can be charged with a crime if you provide a false statement on it. If you have any questions about your Affidavit of Domicile, it is wise to seek legal advice.